The Avast 2017 is a revolutionary release of the year as it includes so many latest and advanced features that can fight with the powerful viruses and malware. This is dynamically amazing anti-virus. The new model has some renovations and has better power to fight with malware and viruses. This “Avast 2017” will work as surveillance program for your machines. Avast is anti-virus software which is developed by AVAST Software Company in 1988.Its latest release is complete virtualization to make your system’s safety and protection higher than before. The Avast 2017 Safe-Zone is now providing an isolated desktop fortress for even more cautious and sensitive operation/programs. What’s more? Avast 2017 has lots of plans by preventing infection of computer through its high defense power. Avast 2017 can also recover damaged files through its backup program. Its anti-virus is freeware program. Avast have lots of products for every type of use. • Now you don’t need to think about strong passwords for your accounts, just ask from “Avast”, It will tell you the password that are strong for your accounts. • It has enhanced and better HTTPs scanning. It scans all website and check if they contain any malware or viruses then it stop you from using that websites. • This software is developed for both PC and mobile phones. • It provides you safe e-shopping and banking. Now your privacy is fully assured as there is “do not track” feature. 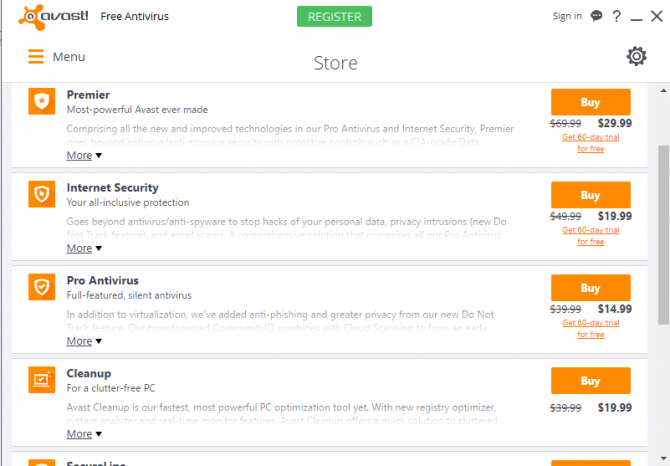 It is free for life version of Avast, not for some days or weeks. It provides security for as many devices as you want. It is customizable you can make it simple or complex according to your wish. This is its premier version which has Nitro technology. It has 30 days trial period. One year registration fee is $69.99, for two years fee is $134.99 and for three years fee is $199.99. Ch-ching, Pay and Bank safely: Now do your banking without any fear of leaking of your information. • Cyber Capture (new): Send files for inspection to experts whether they are safe or dangerous. Go wild with it, because it runs your suspicious files in a safe isolated space so that other things on your system not get harm. Don’t let your router be a hacker’s playground. It is for those who like things to be light. It also includes latest and advanced features. Its trial period is for 30 days with money-back guarantee. One year registration fee is $39.99, for two years fee is $74.99 and for three years fee is $109.99. It is very light and small in size and it has latest technology of Nitro protection. Its trial period is for 30 days with money-back guarantee. One year registration fee is $49.99, for two years fee is $94.99 and for three years fee is $139.99. So we must recommend you to install the latest 2017 version of this antivirus software. This guarantees you the high speed performance and virus free systems. Once you experienced this software, you feel the difference among all. This can possibly reduce all harmful viruses from your system. For Personal system you can use its free version. That also proves to be a great choice of yours and if you are interested in buying its Pro version that will take into exciting world of features. I hope this article will provide you great detail about Avast anti-virus and its amazing features. The link text for Avast free says “Avira” instead of “Avast”. Thank you for the direct download links. thanks for sharing the post with us. one of the best anti-virus running nowadays. good work indeed.